Whoops! Maybe you were looking for Netherlands? For those without comedic tastes, the so-called experts at Wikipedia have an article about Neverland. No, this isn't the real Neverland. This is Satan's Never-land. The gods looked out from Olympus and there were too many continents. No one was really sure what to do about this, so Zeus threw a lawn dart, and it landed on the continent of Never-Neverland. Zeus picked it up and threw it into space, beyond the second star to the right, and straight on 'til morning. The citizens of Neverland were surprised when they woke up in space, because they were in space. They coped pretty well, but within a short time, the people had organized themselves into factions, with James Hook (Captain, Navy of Never-Neverland) declaring himself de facto dictator. Almost immediately, Hook mobilized the citizens of Never-Neverland into a People's Army. He seized government buildings, infrastructure, as well as the nation's only broadcast station. A Personality Cult sprang up about Captain Hook, the new leader of "The People's Republic of Neverland." Women named their children after him. Men were ready to die for him. However, Captain Hook had a dark side. He set out on a program of ethnic and social cleansing. Immigrants, atheists, and the mentally ill were either simply killed or removed to forced slave labor camps. Most tragically, a large number of children, boys mostly, with growth hormone deficiencies were killed or tortured. The lucky ones were simply burned at the stake; those who remained were subjected to cruel "medical" experiments. So many young males were killed that they were simply referred to as "Lost Boys." A mother might arrive to pick up her child from day-care to discover, to her horror, that her son was now one of the myriad "Lost Boys." After 30 years of ruling the People's Republic of Never-Neverland, Captain Hook underwent an image makeover, re-styling himself as "Comrade Hook." Although Neverland's economy was in shambles, rolling blackouts were standard procedure, and the soldiers infrequently paid, Comrade Hook continued to inspire the loyalty of most of his citizens (except the Lost Men, a well-funded and highly secretive underground militia dedicated to achieving re-unification with earth, so named in tribute to the so-called "Lost Boys" of the Republic's Early days). Eventually, Hook's public appearances grew infrequent, and after a failed assassination attempt, he became paranoid and was almost never seen in public. Body doubles traveled the country, but few were fooled. Rumors ran wild that Hook had died. The Lost Boys sensed an opportunity. Led by the horned god Pan's second cousin, Peter Pan (who always wore a funky green feathered hat to cover up his horns), they stormed Comrade Hook's Southern Palace and decapitated him. Pan rechristened the People's Republic of Never-Neverland to "North Neverland." But public outcry forced him to drop the word "North," leaving the country's name as simply "Neverland." There were sound economic and public-relations reasons for doing this, but it struck many back on Earth as simply petty. Nevertheless, after a promising few months of democratic reforms, Pan seized the reins of government, declaring himself emperor. He sent Tinkerbell, his envoy, to retrieve the Oracle at Delphi to christen him Emperor of Neverland. Some considered this to be a corruption of the ideals of Neverland, but they were beheaded. Everyone else liked Pan, because he was charismatic, an efficient leader who made many necessary reforms, and he would kill them if they criticized him. The industrial economy of Neverland was dismantled and reconfigured, as were agricultural practices. The chief exports of Neverland today are wine (called "Zeus Juice" in Neverland vernacular), video games, teddy bears, and gigantic beds. Rumors swirl about Pan's mental condition, and many allege pedophilia. These rumours were partially confirmed when Pan made it mandatory by law for women between the ages of fourteen and twenty-five to marry their brother (or sister, provided they did not have a brother (or the nearest tree, provided they were an only child)). Neverland has other problems. It is in a state of chaos, with Neverlandian scientists selling their talents to nymphs, monsters, and harpies. The country is in a state of humanitarian crisis, unable to produce enough food to feed its own citizens. In recent years, Pan was deposed, and the population elected one of Hook's surviving lieutenants, Smee, to serve as prime minister. 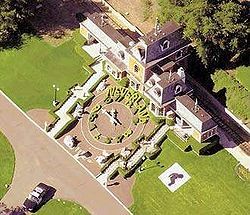 Neverland is not to be mistaken for the Netherlands, which is a tiny country in Europe and does actually exist. Metallica made a song about going "... off to never-never land." This was, of course, referring to Michael Jackson's residence, where the band often retreated to (uninvited) after studio work. They would then hang around Neverland until late in the night, leading to the usual routine of a surly James Hetfield whipping beer cans at Michael Jackson and calling him names. This page was last edited on 31 August 2012, at 08:18.